Materials technology In materials technology, KSB focuses primarily on the components in pumps and valves that are subject to high mechanical stress. The challenge: individual components need to cope with increasingly high operating pressures and temperatures. 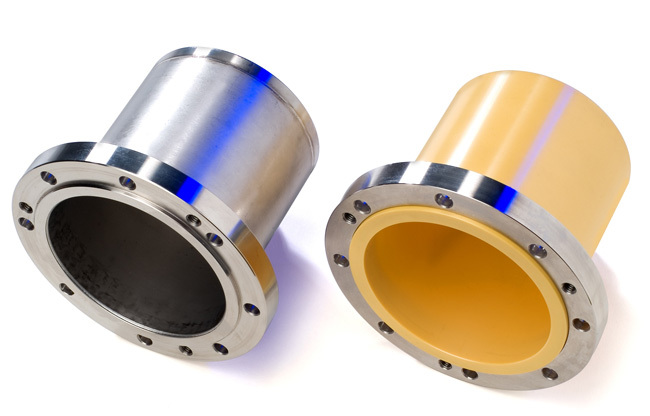 This places exacting demands on them in terms of abrasion and corrosion resistance as well as component reliability. In its research, KSB makes use of the modern resources of chemical analysis as well as metallographic and mechanical examination methods. One example of KSB’s success: in collaboration with the University of Erlangen and a number of Fraunhofer Institutes, KSB is working on improving the properties of ceramic plain bearing materials. The aim is to develop a new composite material from diamond and ceramic characterised by extreme wear resistance and component reliability. By combining these two materials, innovative products can be manufactured that exceed the current state of the art in terms of performance and economic efficiency. Researchers at the Fraunhofer Institute apply a wafer-thin diamond film to ceramic components. In the KSB production and testing facilities, KSB’s materials technology specialists monitor pumps with diamond-coated ceramic components in long-term operation.